Delivering throughout Ireland 24/7, Transton Logistics is a fully Irish owned company based in Ashbourne, Co. Meath. Managing Director Warren Johnston appreciates the importance of always keeping his promises and always being available to help with any problem, no matter how large or small. The progressive Transton Logistics was set up in 2011 by Warren Johnston and has since developed into a family run business with particular emphasis on offering a high standard of customer service and total customer satisfaction. Warren’s father ran his own haulage business “for years and years” but Warren got involved in the transport industry in a roundabout way. “I served my time as an electrician but when the downturn came I went out and bought a lorry,” he revealed in conversation with Irish Trucker & Light Commercials. 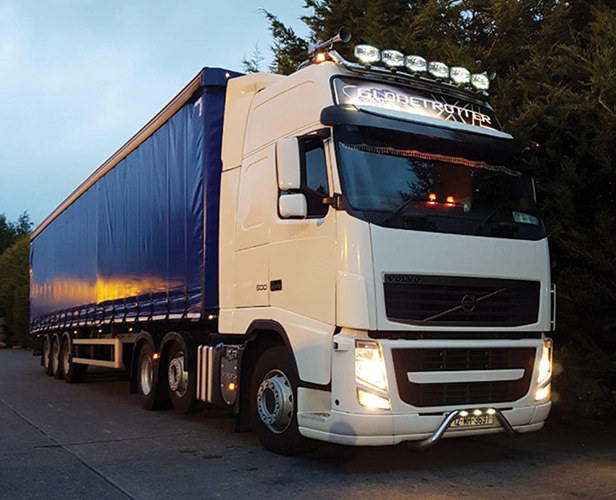 Warren started out with one lorry and one van ,and a determination to grow the business into a leading transport company by providing exceptional service and reliability. Seven years on from its inception, Transton Logistics today operates a fleet of seven trucks which consists of five Volvo FH trucks, one Scania and their newest addition, a Renault which was purchased from First Choice Commercials. They also have a small division of vans so they handle small transport and delivery requirements. A dedicated and proactive company with the ability to adapt and modify its services in order to deliver the right solution every time, Transton Logistics Ltd offers a wide range of transport services and warehousing options to meet customer demands. A fully licensed haulage company with full goods in transit insurance and liability cover, they offer a combination of HGV’s and LGV’s for various volumes of freight. They also offer regular slider, flatbed, and tautliner trailers, all of which are hired from a company Hire 45 ,owned and run by Warrens younger brother Adam. At present, their workforce totals 10 employees and includes Warren’s wife Emer who runs the busy office. All of their seven drivers are trained to comply with CPC regulations while all vehicles are equipped with GPS satellite tracking and on-board cameras. A professional and experienced road haulage and logistics company operating nationwide, customer satisfaction is their number one priority. They count Primeline Logistics amongst their valued list of loyal clients. Not content to rest on his laurels, Warren has ambitious expansion plans in the pipeline. The currently offer their clients many options for storage and crossdocking in their 6,000 sq ft warehouse in Ashbourne but he has already committed to considerably expanding that side of the business in the not too distant future. “We started warehousing in February this year, doing a small bit of storage and also freight forwarding,” Warren outlined. “We’re taking on a new 20,000 sq ft unit in Ballycoolin Industrial Estate and that will be operational very soon. Very much hands-on, Warren divides his time between warehousing, transport and being out on the road behind the wheel. Looking towards the future, he knows that by continuing to provide exceptional service, putting the company’s clients first and always being reliable and efficient, they will continue to grow as they help their clients to grow. It is a philosophy that has served Transton Logistics well to date and no job is too big or too small. Contact Warren and Transton Logistics today to discuss any of your delivery requirements and best options.